My first birth left a lot to be desired. My son came at 35 weeks and it was not the hospital birth I had imagined or wanted. I felt like I missed out and I knew there was a better way to give birth. My husband (Darrell) and I discussed home birth for our next baby but ultimately decided on a birth center. I found my awesome midwife, Cheryl, who I love and trust and started to get excited as I knew I was on the right path. After researching natural birthing methods online, Hypnobabies sounded perfect for me. 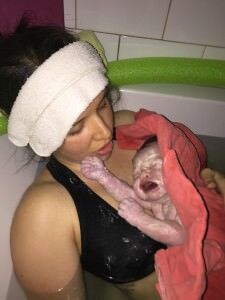 The birth stories and videos were amazing and I felt it was exactly what I needed to achieve my desired birth. I also started looking for a doula as soon as we found out I was pregnant and decided a hypno-doula would make sense. I hit the jackpot when I found Anne who ended up being my doula, class instructor, placenta encapsulator and one of my biggest supporters throughout my pregnancy and birthing time. I assumed since I’ve already given birth once that I knew a lot, but I was completely wrong. The Hypnobabies class was extremely informative and comprehensive. I felt enlightened and empowered after each class. Darrell and I really enjoyed the course and our alone time in the car each week to talk about everything we learned. Throughout my pregnancy I was nervous about having another early baby, but I can honestly say that Hypnobabies calmed all of those fears for me tremendously, along with the amazing care I received from my midwives. I knew my birth would take the path it was meant to and I needed to envision the positive birth I desired. Listening to my hypnosis tracks every night was such a peaceful way to end the day and always put me in a deep sleep. I also enjoyed listening to my Hypnobabies affirmations everyday on my way to work. 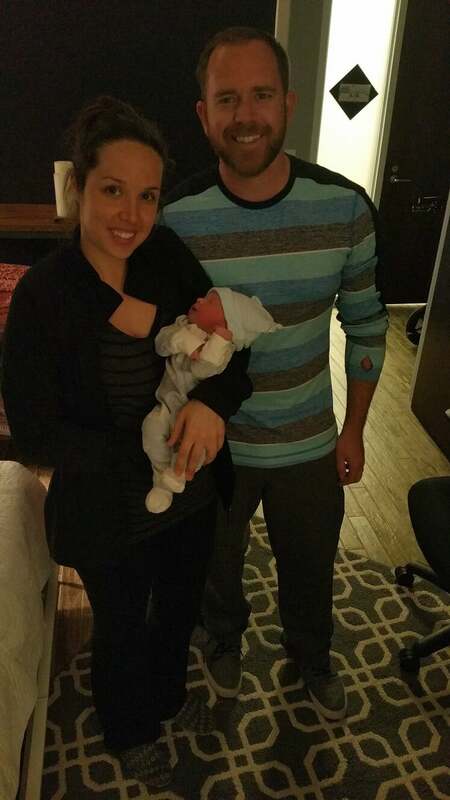 I felt excited to meet my little guy and knew I would have the amazing natural birth I wanted. After many, many weeks of practice waves I made it to 37 weeks and felt so proud of my body. Prior to that, there were a couple times my body seemed to be gearing up for birth but I listened to my Hypnobabies “Baby Stay in” track and told my little guy to stay put for a little longer. I knew we would make it but I did let doubt creep into my mind a couple times. Exercising, rest, chiropractic adjustments, acupuncture and a healthy diet helped me feel confident I was giving my body and baby what we needed to be happy and healthy. On Tuesday afternoon, I had my weekly appointment at my birth center. I asked Darrell to come along because there was a new midwife (Monica) I wanted him to meet, in case she ended up being at our birth. According to my guess date I was around 38.5 weeks and I was feeling ready to meet my baby. During the appointment I let curiosity get the best of me and had a cervical check, since I knew I wouldn’t be disappointed regardless of what the outcome was. I wasn’t dilated at all, baby was sitting high and I was about 50% effaced. I was a little surprised but not discouraged because I knew the numbers meant nothing. If anything, it was great practice to use my Hypnobabies lightswitch technique and I was surprisingly comfortable while Monica was checking me. After the appointment, Darrell and I had a quick lunch before I went back to work and the rest of the day was as normal as any other. At bed time I listened to one of my hypnosis tracks and drifted off to sleep like I did every other night. Around 3:30am I woke up to birthing waves which were much different than my practice ones. I used my hypno-lightswitch and they were coming frequently enough that I was unable to get any more sleep, but I was still comfortable. After a few more I decided I would time them. The first wave was eight minutes, the next was seven and the next was around five. I was confused why they continued getting closer together one after another. Around 4am I was on my hands and knees in bed and decided I should wake Darrell up. I quietly told him I was having strong waves, but I was still in denial it was my birthing time. He calmly asked me if I had timed any and when I told him they were about 5-6 minutes apart he said we should give it another half an hour to see what happens. After about one or two more I asked him to run me a bath to see if that would calm things down. I got in the tub while Darrell sat with me and timed waves that were consistently around five minutes. It felt natural to use my hypnosis and I felt proud of myself I was using my skills I had worked so hard to learn. I sent Anne a text to give her an update and ask her what to do next (maybe get ready to have a baby?!). She told me to trust my gut and see what the midwives had to say. Next, I sent my mom a text and strangely she was awake at 4:45 that morning. She told me the day before she thought the baby would come soon because her knee was acting up, which I laughed at. She had knee surgery the day before my first son came so I guess her knee predicts birth! I asked her to come over to watch Landon because we might need to leave soon. After that, Darrell talked to Cheryl and she told us to come in and have a baby. I still wasn’t fully sure it was time but I was going with the flow. Darrell called Anne and told her we were heading over and it was go-time. After my mom arrived I got out of the tub and slowly moved around the house preparing to leave as I had to lean over furniture and turn off during waves. I could tell it was making my mom crazy I wasn’t running out the door. I listened to one of my birthing day tracks in the car and reflected on how cool it was that we were going to the birth center when I had envisioned it would happen. It was so quiet and peaceful out with the sun coming up on that beautiful spring morning. We arrived to the birth center a little before 6am and were greeted by Anne and Olivia. I was so excited Olivia was there. She was one of my favorite people to see at each of my prenatal appointments. We walked to the elevator and made our way to the room(s) I would birth in, stopping along the way for a couple waves that were coming around three minutes apart. When we got to the room Cheryl was there and I noticed the tub was already filling up, which I thought was strange since they had no idea if I wanted to get in the tub any time soon. It turns out the building was shutting the water off from 6:30-8 that morning so they rushed over to get both tubs filled for me. One of the tubs was filled with only hot water so it would still be warm by the time the one in my current room was cold. Everyone graciously kept this information from me so I didn’t stress [very important!] and luckily I didn’t notice the signs on the building door when we walked in. After getting settled in the room and a few more waves Cheryl asked if she could check me, which I agreed to. I didn’t find out my numbers but I was 4cm and 90% effaced (I’m glad I didn’t find out). I had a couple more waves leaning over the bed and asked Anne if I could get in the tub. She asked Cheryl who had stepped out of the room (this is when Anne found out about the water situation) and I stripped down and hopped in. It felt so relieving to be in the water where I had practiced my hypnosis many times. I continued to turn my Hypnobabies switch to “off” [deepest hypnosis and comfort] during my waves and come to “center” to chat with everyone in between, but around 6:45 I had to stay completely off and my mood felt a lot more serious. I started to vocalize much louder and “ahhh” through each wave. It felt good to let my energy out and I surprising didn’t feel self-conscious. Anne read me Hypnobabies hypnosis scripts while the Relaxation Music track played in the background. The scripts kept me where I needed to be and my mind from wandering. Darrell provided pressure on my lower back after a quick lesson from Anne, which really helped keep me comfortable for much of my birthing time. Between a couple of waves I opened my eyes and noticed Monica had arrived! I was so pleased to have her there and felt I had the perfect birthing team I had envisioned. I felt so fortunate that everything was unfolding how I hoped it would. Around 7:40 Cheryl checked me again and I was completely dilated with a bulging bag of water. I was starting to get tired and decided to gently push to help my water break, with no success. I mentioned to Anne I felt a little nauseous and knew that was a good thing but tried my best to ignore it. Olivia put some peppermint essential oil on a tissue for me that helped keep it at bay. Then, after squatting outside the tub through a couple of waves with Darrell supporting me, I was moved to the other birthing room tub. I had no idea why I was moving rooms at the time but I was in my birthing zone and didn’t question anything. About an hour later I asked Anne if one of the midwives could break my water because I didn’t feel like I could make any progress to bring him down. After Cheryl broke it I felt so much relief from the pressure I was experiencing and knew that was the right decision. Cheryl told me it would kick things up a notch but I was ready to meet my little guy. I got back in the tub and started feeling very pushy, so I started to work on bringing my little guy out to meet me. It felt good to push along with my waves but it was also very intense. Soon after that it was completely involuntary and I was pushing with force before his head came out, and with another wave and push his body came out! At 9:37am Declan Joseph was born into the water weighing 7lbs 3oz. Monica handed him to me and I just stared at him, absolutely speechless. Time stopped and I felt like it was just him and me in the room. I finally said, “we did it!” and just admired my vernix covered little baby. Darrell had tears of joy on his face and I couldn’t wait for him to hold his son. 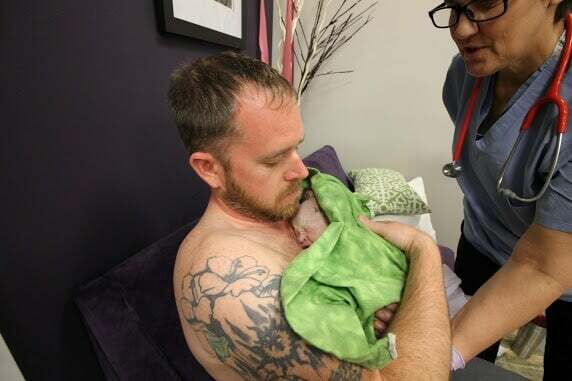 After the cord stopped pulsing, Darrell cut it and got to hold his son for the first time while I got out of the tub and into bed to deliver my placenta. I was checked for tears and only had a tiny one, which didn’t require any stitches, and then I had my baby back in my arms. An hour later Declan nursed for the first time while Darrell and I took in our sweet little boy. We were home in bed a few hours later reflecting on the amazing morning we had. And just like that we were a family of four! My favorite Hypnobabies cues and techniques: As soon as my waves started in the early morning I used my finger-drop/lightswitch hypnosis technique to stay comfortable, but as my birthing time progressed (when we got to the birth center) I used my release cue and would keep my hypno-lighswitch “off” or come to center between waves. Towards the end I stayed in center so I could stay active and push. While I was at home in the tub I also listened to my Hypnobabies birthing day affirmations track. My husband and doula used the relax cue while putting pressure on my shoulder- that was definitely my favorite cue to calm my body. My doula also read me Hypnobabies hypnosis scripts during my birthing time while we had the relaxation music on which was perfect for me. During my short pushing phase I listened to the “pushing” track. I couldn’t hear it very well as I was “ahhhing” baby out but I knew my subconscious was listening![yes!] The afterbirth waves were a little intense so I used my release cue and came to center to stay comfortable. I also couldn’t have had the amazing birth I wanted without my incredible birthing team. Anne, Cheryl, Monica and Olivia made it an unforgettable experience that I hope every woman has the opportunity to have. I’m especially thankful for my wonderful husband who was my biggest support. He’s an incredible father and selflessly takes care of the boys and me. I couldn’t have taken this journey without him.